On September 9, 1981, all hopes seemed lost of England reaching the 1982 World Cup in Spain after suffering an infamous defeat in Norway. With favourites Hungary and Romania – plus outside bet Switzerland – having games in hand, it was out of England’s hands. Things got even worse two weeks later, when Romania and Hungary drew 0-0. This meant that if Hungary took maximum points from their games against Norway and Switzerland and Romania picked up a win and a draw from two meetings with the Swiss, then it would be game over for England before they played their last match at home to Hungary on November 18. All the nation could do was hope. When Romania took the lead during the second half at home to Switzerland on October 10, it looked just about the end for England and manager Ron Greenwood. But then the Swiss unexpectedly fought back to win 2-1 and throw England a sizeable lifeline. Whatever happened in the other qualifiers, matters were in English hands again. Hungary duly won their next two qualifiers to book their place as one of the top two – and end Swiss hopes at the same time – while a draw in the return game between Switzerland and Romania meant the picture had now totally changed from a few weeks earlier. Suddenly, England needed only a point at home to Hungary to qualify. They had much to thank the Swiss for. So too did the Football Association. England’s lifeline had seen ticket sales escalate from about 30,000 to a 92,000 midweek Wembley sell-out, meaning the match could be shown live on television (quite a rarity for home games at the time apart from when Scotland visited). The BBC would have the rights, Jimmy Hill hosting live from the stadium in the company of pundits Bobby Charlton, Lawrie McMenemy and Bob Wilson. England looked to finally make it through to a World Cup finals after their failures for the 1974 and 1978 tournaments. Having qualified automatically in 1966 (hosts) and 1970 (holders), it was some 20 years since the Three Lions had last successfully come through a World Cup qualifying group. Missing out again didn’t bear thinking about, particularly now the expanded finals contained 24 teams. Comparisons were being drawn in the build-up to England’s often-recalled costly draw against Poland at Wembley eight years earlier, not least because Peter Shilton would again be in goal for England. But the situation was not quite the same or as worrying. This time around a draw would be sufficient for England and it was not a head-to-head fight, given Hungary were already through and guaranteed top spot. 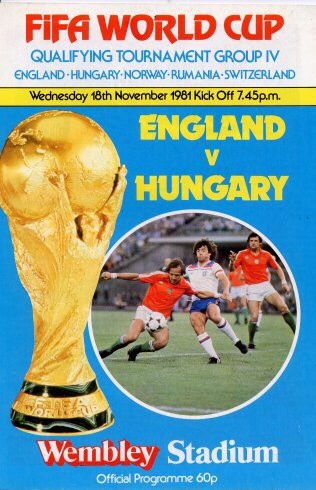 England had been the only side to beat the Hungarians so far, their excellent 3-1 win in Budapest in June 1981 being at odds with much of the rest of their stumbling qualifying campaign. Now it remained to be seen how determined Hungary were to help out their Eastern European rivals Romania – a side who could unbelievably qualify having scored just five goals in eight matches (two of them against England). And so the nation anxiously waited for this do or die match, willing to forget about the turbulent qualifying campaign if the team could get the result needed to go through. Needing a draw at home is not always to a side’s advantage, as they can seem caught between a natural instinct to attack the visitors and a fear of conceding a vital goal. The situation was effectively identical to when England played Croatia in the infamous Euro 2008 qualifier 26 years later – the visitors having already qualified and England needing just to draw – and like on that painful occasion England would be having to make defensive changes, with young West Ham United defender Alvin Martin stepping into the breach at centre back to replace Dave Watson. It promised to be a tense night in the Wembley rain, but much of the anxiety eased as Paul Mariner scored after 14 minutes. Terry McDermott floated a free-kick into the area, with goalkeeper Ferenc Meszaros unable to claim in a crowded area. It fell to Trevor Brooking, who fired away from goal into the path of Paul Mariner. The Ipswich Town forward seemed to stumble as he shot, but he managed to divert the ball into the net. It was a slightly strange goal to sum up a surreal qualifying campaign, but also a vitally important one. Wembley erupted, several players mobbing Mariner while old campaigners Brooking and captain Kevin Keegan embraced each other a few yards away. They had waited their whole careers to play at a World Cup – now it was finally within sight. England now effectively had a two-goal cushion in terms of what was needed to qualify, something that would only have been taken away if Hungary had scored with both shots they managed during the night as they offered little going forward. Shilton dealt competently with both efforts, as the shots poured in at the other end towards Meszaros – who had recently helped his Sporting Lisbon side knock Keegan and Southampton out of the UEFA Cup. England could have won by a big score as they looked to wrap up the win in the second half, with players including Keegan, McDermott, Bryan Robson and substitute debutant Tony Morley all going close. Yet the real issue was England didn’t throw it all away and thankfully they were not troubled, the only disappointment being they didn’t add to their goal tally. Although the pessimists couldn’t relax until it was over, the match wasn’t quite the anxiety-fest that had been anticipated with the England defence holding firm. Keegan picked up a cut lip for his troubles, but he wasn’t complaining. Like several of his colleagues, he was set to finally grace a World Cup finals when it was probably going to be his last chance (butthings wouldn’t go to plan quite as much as he hoped – a story for another day). The atmosphere at Wembley was frenzied, TV viewers able to hear the passionate singing as the referee prepared to blow the final whistle. Thousands roared as the 1-0 win was confirmed and England had finally made it. “England are back” chanted the crowd, while Greenwood was given a belated 60th birthday present – a week after reaching the landmark – as he could look forward to bowing out from management on the greatest stage.